Multiple Android 4.3 JB leaked update firmware files have been out for AT&T Samsung devices today. AT&T Samsung Galaxy S4 SGH-I337 is one of those devices. Other devices include Samsung Galaxy S3 I747, Galaxy S4 Active I357, and the Galaxy Note 2 SGH-I317. These leaked files will make you happy if you are a beta tester, giving you perfect glimpses of what would be coming in the very much expected Android 4.3 JB updates coming on AT&T devices very soon. This leaked UCUEMJ6 Android 4.3 brings features from Android 4.3 JB including Galaxy Gear Smart watch functionality support, TRIM support, and Knox security suite among other features. And even better, this build has got the locked-bootloader like the recent I337UCUAMF3 4.2.2 update. 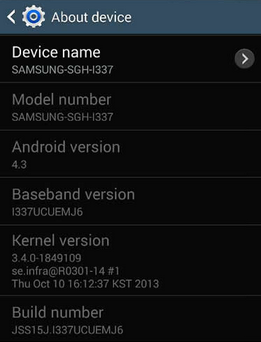 A leaked Android 4.3 firmware build I337UCUEMJ6 has also giving it’s way for AT&T Samsung Galaxy S4 (SGH-I337). Beta testers, now it’s time to take some fun of what’s new behind AT&T Galaxy S4 Android 4.3 update. Some of our sources has showed that this leak firmware are legit and it works perfect after installation, and since its already starts to surface, let’s get rollin’ and let the flashing begin. But wait, this is for beta esters only, the official OTA update will arrive soon and according to numerous reports that we have gathered so far, it’s going to be rolled- out beginning Novemeber 13. But we cannot rest assured that this tentative date is legit until AT&T folks make an official announcement. Stock for Heimdall (MAC & Linux) original XDA thread. Please to note that since UCUEMJ6 Android 4.3 is NOT an official Android 4.3 update yet, installing it might be a bit risky. If you are not an advanced user, you should take a good look at how these leaked firmware updates work and how you can be able to restore back in case things do not work out. Always remember to create backup of all your important files as flashing firmware files wipe out all the data. Make sure to amply charge up your device’s battery. For more please follow any of our guide posts to know more about pre-reqs and steps to flash any firmware files.